I've been using the antique black wool that I dyed a few weeks ago. It's not very exciting antique black, just sort of common black that has a little bit of depth to it. I actually prefer the antique black that can be made using red and green and blue wool - if it is barely overdyed with black, a little of the red and green and blue peeks through. Then it looks like old wool, wool that has been used and worn and rubbed so much that some of the black has worn off. Sometimes a regular piece of black wool straight off the bolt has some or all of those colors hiding under the black. That happens when something was wrong with the original dye process, so the wool was overdyed. I love finding that kind of black. All you have to do is bleed off some of the black dye, and there you have wonderful worn looking antique black. 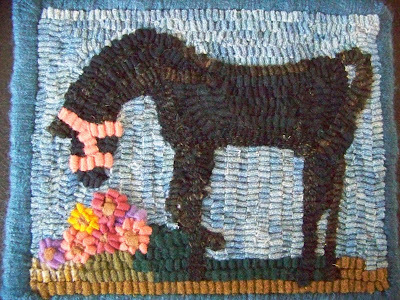 I used the antique black for this horse in my Yahooker swap mat. It's not easy to get something more than a flat silhouette when you want to hook a black horse - and I've loved black horses ever since early childhood - so I let the variation in color in the antique black delineate some of the muscles and contours of the horse. However, my main use of the antique black has been in my Gene Shepherd blog hook-in rug ( http://geneshepherd.com/) . Over the last weekend, I played around with various colors for the scallops and for the background beyond the scallops. I hooked one corner all in blue, with red scallops - ugh! Then I hooked black scallops and red background - ugh! again. 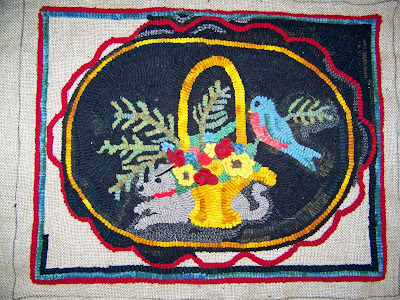 One problem is that I've hooked the basket and flowers in brighter colors than I ever use. I wanted to bring those colors out into the background, but they are just too bright for me. I picked the darkest strips of the basket color and hooked them around the medallion, and then hoooked a pair of beauty lines - one red, and one of the blue plaid I used in the wing of the bluebird. After the ugh! attempts, I decided to fill everything between all of the lines with antique black. In a few places, I'm going to hook in short bits of very light black, just to keep the black alive. Today, I'm going to hook outside the red line to make a black frame all the way around. I'm going to kind of jump around with the rest of my hooking, in case I run out of antique black and have to cook up some more - I'm leaving just-in-case spaces for the new wool to fit in. I'm so pleased to be doing this rug as part of Gene Shepherd's hook-in. He gives the greatest hints on his blog while he's hooking the same pattern - I think I've heard more suggestions and good ideas than in a regular class - the great thing about a blog class is you don't get too tired to listen and learn, which is always what happens to me in a day-long class (one of my post-polio symptoms.) With a blog, you can stop and start whenever you want and you can go back and re-read, re-look, anytime, day or night. So, here's a "shout-out" to Gene - THANKYOU GENE!! !